The rustic style is commonly associated with charming little cottages surrounded by nature in the middle of nowhere. They have wooden walls, simple furniture, and animal skins on the floor. There’s gorgeous wildlife everywhere you look. The style is characterized by unrestrained beauty created with simple, practical, but dazzling ideas. It’s a perfect recipe for a cozy, timeless arrangement, which works well even in the city. If you’ve had enough of cold, ascetic interiors, keep reading and you’ll definitely find some marvelous inspirations. What exactly is the rustic style? Let’s start by answering this question, since instead of imagining a lovely house in the mountains, some people think of interiors straight from a museum: a tile stove in the corner, heavy stools, a table made of a few random planks, and hand-painted, clay pots. Is that really the case, though? The rustic style does in fact draw inspiration from a simple, country lifestyle, folk art, and practical solutions, which were dictated by lack of access to technology and, most importantly, money. However, it isn’t true that the rustic style is crude or straightforward. It takes the best elements of rural crafts and combines them with modern designs, resulting in a beautiful, yet functional arrangements in good taste. And how can you add some needed natural inspiration to a rustic-style room located in a big city? 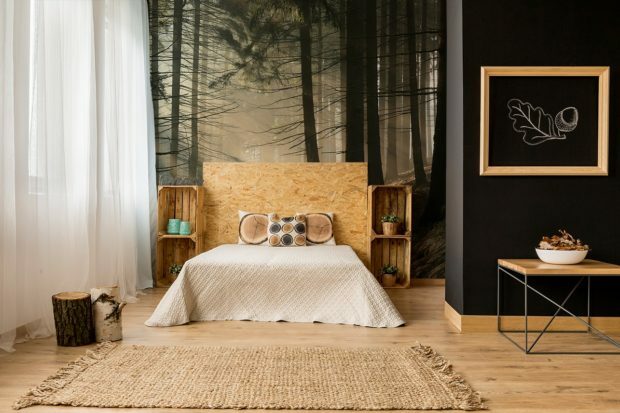 You can complement the style with a picturesque mountain or tree mural. These incredible designs enhance the idyllic character of the interior and provide a spectacular view. If we had to describe the rustic style with two words only, we’d choose nature and simplicity. It focuses on functional minimalism, just like traditional country cottages where you could find only what was necessary for life. What to consider when decorating an interior in such aesthetics? Most importantly, use natural materials, especially wood. Ideally, it should be unfinished wood in its natural color. Without layers of varnish, wooden objects gain their unique rustic character. As for simplicity, it doesn’t have to imply a lack of decorations and adornments. Let the natural beauty of wood play the first fiddle in your interior. Then complement it with undyed cotton and linen fabrics. How exactly? A great idea is to use these materials for upholstery, curtains, or pillowcases. If you like wicker, an amazing addition may be a comfortable chair or a chaise longue to aid relaxation. Don’t forget about the appropriate color scheme. Rustic arrangements use mostly nature-inspired earth tones. However, you don’t need to limit yourself only to brown, beige, and cream. You can liven up the space by introducing more expressive hues such as ocher, brick red, or even olive green. Although everything we’ve said so far was true, most of you are surely waiting for specific ideas on how to easily create a rustic-style arrangement. So sit back and enjoy a couple of pieces of advice that we’ve prepared for you together with experts from Myloview. This interior is a perfect place for a gorgeous coffee table. The tabletop could be made of aged planks or a single chunk of solid wood with gnarls and tree rings visible. Add a faux animal skin on the floor, a few cow print cushions on the couch, and a hunting trophy mounted on the wall. However, to make sure that no animal gets hurt, use a metal deer head or only antlers which are shed by these majestic animals every year. Although we said at the very beginning that you shouldn’t overdecorate rustic interiors not to lose their authentic natural character, you can introduce one expressive decorative piece, especially if you wish to be closer to nature. 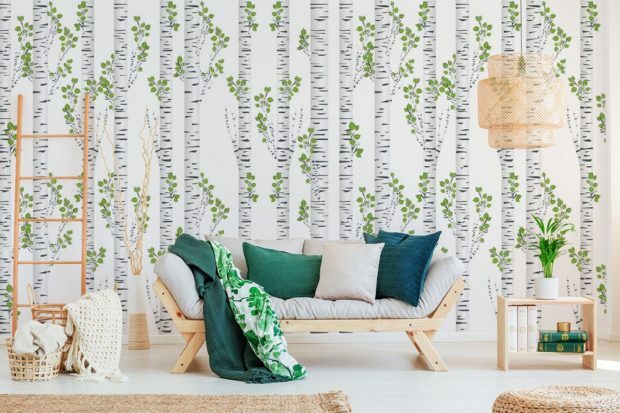 Consider a birch tree mural. Its characteristic black-and-white thicket in a large-format photograph will make you feel as if you really lived in a countryside cottage. With such an awe-inspiring background, your rustic arrangement will look even more stunning. Now let’s move on to the bedroom. The most important piece of furniture here is the bed. Instead of a typical model, choose one with a wooden headboard. The devil’s in the details, though. To enhance the effect, the head of the bed should be made of old, timeworn planks with clear traces of use. Where to get them? With a bit of resourcefulness and ingenuity you can make such a headboard yourself. Simply use pieces of an old closet sitting somewhere in the attic or the boards from a door that you replaced some time ago. You can also put a hand woven rug with a folk-inspired design on the bedroom floor. What if you don’t want to replace your furniture? The rustic atmosphere might also be achieved with the use of appropriate accessories. Anything related to folk art and traditional crafts is a safe bet. Start with clay or ceramic fruit bowls and colorful vases. Other interesting ideas include DIY jar lanterns, or candlesticks made from whimsically shaped glass bottles. The idyllic character can also be enhanced with the use of mountain murals. The marvelous images of the Rocky Mountains can always bring you a bit closer to nature, no matter where you live. As a final thought, it’s worth noting that the rustic style may also be seen as a partial inspiration instead of a fully defined style. Despite what many may think, the rustic aesthetics look remarkable when combined with modern design. The style can be combined with minimalist or even industrial-style interiors. In this specific case, the more austere the furniture seem, the better the overall effect. A red brick wall in a living room will look delightful when combined with a massive table made of solid wood. Similarly, bare concrete walls in your bedroom might be contrasted with a wicker chair, a folk-style rug, or majestic antlers. Another excellent idea is decorating a wall with a tree mural. A foggy forest or any other picturesque landscape combined with rustic elements (furniture, ceramics, rugs) will provide a breath of fresh air for your interiors, revealing their brand new, idyllic character.